We’ve heard the virtues of continuous integration and continuous delivery at SpringOne before. There’s plenty to be found on the power of Concourse as a CI tool. Even PCF operators are big on Concourse and its ability to provision and repave the platform. This year, there was talk of inviting a new friend to the party. Pivotal announced that it “has a team working on contributing Cloud Foundry support to open source Spinnaker.” Spinnaker already supported AWS, Azure, GCP, Google App Engine, Kubernetes, and other platforms. Now, Pivotal is ensuring that Cloud Foundry is a first-class citizen of Spinnaker. Jon Schneider covered this on the main stage and in detail in a breakout session. Spinnaker is one of the few true multi-cloud delivery platforms. Started by Netflix, it has contributions from Google, Amazon, Microsoft, and now Pivotal. There are two essential components: a multi-cloud application inventory and pipelines. The inventory piece is critical, since applications rarely live on a single platform. Spinnaker presents an aggregate view of all your applications, clusters, and instances. (It can do this without even having deployed them.) This allows users to determine their application health and state across platforms. It also means Spinnaker is distinctly able to run out-of-band processes. As a result, it supports running things like vulnerability scanning or chaos engineering tooling at build time. Along with the inventory, as you’d expect from a CD solution, Spinnaker offers pipelines. Even if you are a user of Concourse, Jenkins, or other CI tools, Spinnaker is best suited to help with these delivery aspects of your pipeline. Check out Spinnaker on GitHub and at https://www.spinnaker.io/. Keep an eye out for the 1.10 release which will include an early version of Cloud Foundry support. Presentations about security topics don’t always offer the most gripping demos. Still, I was very interested in a few of the breakout sessions on CredHub, the credential manager that’s baked right in to Cloud Foundry. It turns out, security can be seductive. CredHub is the credential manager that’s baked in to Cloud Foundry. In his three sessions, Peter Blum offered a few different looks at CredHub. There was a great overview of how it works with PCF and Spring. His most fascinating session, though, brought the magic of CredHub together with Kubernetes. In his example, a webhook object in Kubernetes injects CredHub into pods on the cluster. Then application code in the pods may access secrets from the credential store. It was a slick demo and an incredible way to show off CredHub’s simplicity and strong capabilities. Peter’s CredHub with Kubernetes code is on GitHub! CredHub offers a secure way for humans and applications to interact with secrets. With Pivotal Application Service and the CredHub Service Broker, developers never have to know or see any passwords. Passwords are only available to application containers with authorized access. Each application container includes a signed certificate and key. This key provides identity when communicating with CredHub. You can also go straight to the CredHub Docs or the GitHub repo for more detailed info. For you Spring buffs, there’s even a Spring CredHub project. What’s a tech conference today without the mention of serverless? SpringOne definitely had its share of serverless moments. Of course, Pivotal Function Service (coming soon) got a shout-out from Onsi Fakhouri. Plus, there were plenty of other details covered about Knative and riff at the conference. Mark Fisher did a live demo of riff on the main stage. There were also some very informative and demystifying sessions on Knative and riff. They ranged from YAML-heavy to YAML-free with one especially for Spring developers. This is the technology that is driving Pivotal’s serverless future. Knative and riff will power the yet-to-be-released Pivotal Function Service. Check out https://projectriff.io and https://pivotal.io/knative for more details. You can also find both riff and Knative on GitHub. Containers and Kubernetes are hot topics at conferences. What’s even hotter? Taking control of the application lifecycle in a container-centric world. Developers want a fast and secure way to get from source to container. It’s something the Cloud Foundry community has had solved for a while with buildpacks. Now this solution is expanding. Day 1 main stage had a surprise ending from Stephen Levine from Pivotal and Terence Lee from Heroku. They introduced an effort to bring buildpacks to the broader cloud-native community. It’s called Cloud Native Buildpacks, and it joins the CNCF as a sandbox project today. Buildpacks are an “opinionated, source-centric way to build applications.” They are a big part of the magic behind Cloud Foundry’s `cf push` experience. Buildpacks detect the kind of app then fetch and install the tools needed to run it. For operators, the ability to manage a curated set of buildpacks is attractive. It also allows for rapid, secure patching en-mass using remote image layer rebasing. All the while, developers simply focus on delivering value for their own customers. The new specification and set of tools enable buildpacks to be used on any platform. Check out https://buildpacks.io/ for more info. Meanwhile, use the `pack` CLI to experiment with Cloud Native Buildpacks. 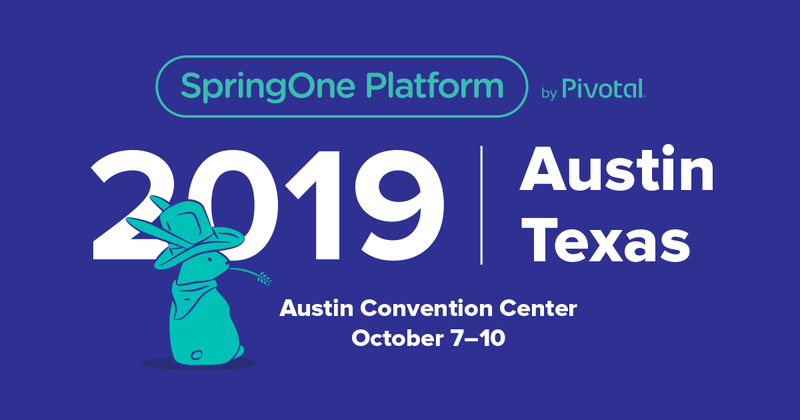 Reactive programming is not a new concept for SpringOne Platform attendees. I vividly remember Phil Webb’s awesome keynote from last year comparing blocking with non-blocking. (Who can forget the swimming ducks and cats?) This year there was more Reactive-related fun. There were two impressive keynotes relevant in the Reactive programming space. First, there was the introduction of the non-blocking relational database connectivity driver, R2DBC. We also learned about RSocket, a new message-based application network protocol. In two articles on InfoQ, Charles Humble examines both R2DBC and RSocket. He does an amazing job explaining the advantages of Reactive programming. As Pivotal’s Ben Hale explains in one article, “Reactive programming is the next frontier in Java for high efficiency applications.” He points out two major roadblocks to Reactive programing: data access, and networking. R2DBC and RSocket aim to address these problems. I found RSocket to be particularly fascinating. In the main stage presentation, Stephane Maldini gave a brief but helpful history of TCP and HTTP. He framed RSocket as an alternative to these protocols while sort of bringing the best of each to bear. Rather than simply request/response, RSocket offers four different interaction models. (They are Request/Void, Request/Response, Request/Stream, and Stream/Stream.) What’s more, it’s language-agnostic, bi-directional, multiplexed, message-based, and supports connection resumption. It kind of blew my mind. As always there’s a .io site for RSocket (http://rsocket.io/) and an RSocket GitHub repo. R2DBC is on GitHub too. It’s also worth checking out the related content from the conference. Ben Hale covered both R2DBC and RSocket in his sessions.